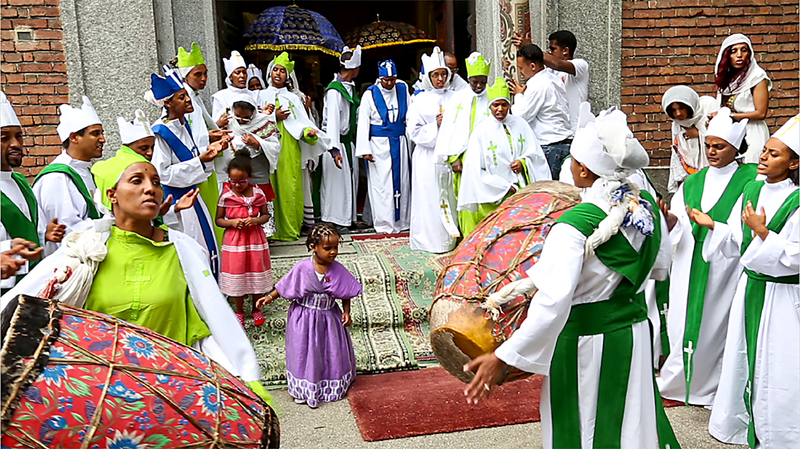 Almost Citizens: Racial Translations, National Belonging, and the Global "Immigration Crisis"
Ceremony at the Eritrean Coptic Church, Santa Maria, Via Ippocrate, Milan. Screenshot from the documentary film Asmarina (2015), directed by Alan Maglio and Medhin Paolos. Courtesy of Medhin Paolos. All rights reserved. Abstract: The article examines some of the ways in which racialized immigrants and their descendants translate hegemonic ethnoracial terms to assert belonging and citizenship in the nation. Through a comparative analysis of the use of "black" and "Latino" in the United States and Italy, the article proposes Latino/a Studies as a lens for investigating how the discourses of immigration and the discourses of race jointly operate to violently exclude and silence racialized people from the nation. Setting off from the premise that Latinidad emerges out of the circularity of immigration, blackness, and coloniality, the article examines how black Latin American migrants grapple with different—and often oppositional—racial systems to assert belonging and representation within the nations that exclude them. Black Latinidad becomes a productive category of global contestation, but one that remains connected to racially restrictive national immigration policies, political disenfranchisement, state violence, and poverty. The article insists on the need to examine the multiple ways in which language and cultural performances complicate our understandings of race amidst the global climate of anti-blackness, immigration crisis, and the War on Terror. Last summer, as I interviewed filmmaker Medhin Paolos in Milano, Italy, an African street vendor approached us. "Buy this!" he said in English, showing us silk embroidery. When Paolos brushed him off with a polite, "No, grazie," the vendor exclaimed with surprise: "Parla Italiano!" Since neither Paolos nor I looked white (enough) to be just Italian, the vendor explained, he had taken us both for American tourists. Paolos, who is used to explaining her Italian blackness to foreigners and locals alike, told the vendor that her parents were Eritrean. Making himself more comfortable on a table next to us, our new friend then added: "And you speak English too! A black person should always speak English." Joining in the conversation, I asked him why. He responded—in English— "Because black in English is better." Since neither Paolos nor I looked white (enough) to be just Italian, the vendor explained, he had taken us both for American tourists. The vendor’s statement "black in English is better" calls attention to the ways in which language and cultural performances complicate our understandings of race. It also highlights the multiple ways in which dominant versions of race simultaneously contribute to promoting exclusion—Paolos could not possibly be black and Italian—and facilitating inclusion through participation in the global commodification of blackness. Before the interruption, Paolos and I were discussing the growing popularity of what has become known as the black Italian movement, a cultural and aesthetic drive led by the media and local politicians in their efforts to appear more inclusive to a young and intercultural European constituency. The marketing push for black Italianness employs U.S.-produced slogans like "black is beautiful" and showcases Anglicized terms like "nappy" as well as U.S. black pop cultural and historical references. Though black Italianness is appealing to a younger generation, it does not represent the reality of Italians di colori, to use a local term, because, as Paolos explained to me, "It’s not my blackness." The terms that define blackness in Italy (negra, nera, di colore) are part of a complex process of national identity linked to the internal—as in the separation of northern and southern Italy—as well as the external borders guiding the Italian nation narration. Much work has been done to shed light into the northern–southern dynamic of Italy, particularly as related to race and class. It is helpful to remember, however, when thinking about the racialization of migrants in Italy, that the "coloring" of the Italian south is a significant element in Italian racial imagination. The growing demands for cultural diversity and inclusivity of Italians of color are thus very much intertwined with the hegemonic version of national identity that projects southern Italians as abject to the nation. The growing demands for cultural diversity and inclusivity of Italians of color are thus very much intertwined with the hegemonic version of national identity that projects southern Italians as abject to the nation. Much like Latinidad, which, as anthropologist Arlene Dávila argues, simultaneously produces Latinos in the United States as hypervisible and invisible, the term black Italian, rather than a political concept, is a commodified category that, while undoubtedly allowing for more representation of racialized bodies in mainstream media, ultimately produces blackness as a monolithic, exotic category of consumption (2000, 13). This exclusion is also encapsulated in the term extra communitari, often used to refer to immigrants of color regardless of their legal status. The exclusion of Italy’s others is grounded on the discourse italianitá (Italianness) as a homogeneous category of national belonging: "As we see in the work of first and second generation writers, italianitá seems unattainable for black Italians precisely because national belonging is generally understood in terms of specific traits (both cultural and biological) that cannot be simply acquired by a perfect mastery of the language and of the Italian way of life" (Lombardi-Diop and Romeo 2012, 6). Founded on the turn-of-the-twentieth-century eugenicist theory used also to justify fascism, Italianità can never be acquired; it can only be inherited. The discourse of italianità renders Italians of color as, to borrow from Mae Ngai, "alien citizens," persons who are citizens of a nation by virtue of birth or cultural assimilation but who are presumed "foreign by the mainstream . . . and at times by the state" (Ngai 2005, 2). The alien citizenship of second-generation immigrants di colori in Italy calls into question public discussion about the relationship between colonization of the global South and the prevalence of the global "immigration and refugee crisis." Or, rather, the refusal to legally and symbolically admit new (racialized) citizens into the nation (as seen in the case of Latinos in the United States and Italians of color in Italy) crystallizes the prevalence of colonial structures in sustaining the internal borders of the nation through eugenics-derived exclusionary notions of citizen–subject that are based on gender, race, class, and bodily ability. Italy is not usually imagined as a colonial power, however, mainly because it did not exist as a modern nation until 1861. The silencing of Italian colonialism has allowed the European nation to escape the kind of decolonial critique that proliferates in the U.S., French, and British academy, particularly in the fields of Ethnic and Cultural Studies. The fact that Italy has been globally imagined as an immigrant-sending nation, a Second World nation, a Latin nation, and sometimes, "an almost Southern" nation, has also permitted it to escape political scrutiny (see Parati 2005; Lombardi-Diop and Romero 2012). Yet, we need to remember that while Italians were immigrating to North and South America by the thousands (1890–1950), the Italian Empire joined other European nations in establishing colonies in Africa. By 1914, for instance, Italy had annexed Eritrea, Somalia, Libya, and the Dodecanese Islands. African colonization allowed a young Italy to find a sense of national identity in a deeply fragmented and culturally diverse territory through a language of dominance and superiority over its African colonies. The social, political, economic, and human implications of Italian colonization also shaped the nation’s understanding of race, citizenship, and culture, or what is widely understood as italianitá, a term that includes "those who share Italian culture" whether or not they resided in the territory (Lombardi-Diop and Romero 2012, 9–11). One of the most tangible ways in which the colonial legacy of italianitá manifests in the new millennium is through jus sanguinis. Though citizenship by bloodline is not entirely rare among Western and Southern nations alike, the significance of jus sanguinis in sustaining the exclusion of racialized citizens is rarely examined outside legal studies (one exception is the highly publicized draconian 2013 Dominican legislation that resulted in the denationalization of more than 200,000 ethnic Haitians). In the case of Italy, the persistence of jus sanguinis sustains the hegemony of italianitá as Italy grapples with its shift from an immigrant-sending to an immigrant-receiving nation. For people like Paolos, these legal restrictions meant that even though she was born in Italy to Eritrean parents of mixed Italian ancestry, she had to apply for Italian citizenship at the age of eighteen. Unlike the roughly fifty-two percent of Italian-born people who are denied nationality every year, Paolos was admitted to Italy, and, by extension, to the European Community. The fact that she must continuously prove herself Italian (enough) through cultural performance and documentation is an example of how the nation–state participates in the normalization of racism through legal and symbolic actions. After congratulating her, the immigration officer who delivered the news handed Paolos a little flag while saying to the Italian-born filmmaker, "Welcome to Italy." But as our encounter with the vendor shows, neither her cultural belonging nor her eventual legal acceptance into the Italian nation guaranteed Paolos italianitá. The fact that she must continuously prove herself Italian (enough) through cultural performance and documentation is an example of how the nation–state participates in the normalization of racism through legal and symbolic actions. That is, the absurdity that allows for an Argentinian who has one Italian grandparent to acquire Italian citizenship at birth, but denies it to the child of a legal immigrant from an ex-colony born in Italy can only be understood as resulting from racism. Or, to put it in the words of Angela Davis, "[T]he discourse of ‘immigrants’ draws from and feeds on the racisms of the past, the racisms that have affected people of African descent, of Native American people. So, it seems to me that the struggle for immigrant rights is the key struggle of our times. And it is a struggle for civil rights. It is a struggle for human rights" (Wilson 2012). My conversation with Paolos and our encounter with the street vendor bring attention to the urgency to expand theoretical frameworks for the intersectional and transnational analysis of race and racism in the twentieth-first century. Amidst the global War on Terror, intolerance and hate crimes targeting immigrants and people di colori continue to escalate in all institutions of our society (police, universities, and churches). In such an oppressive global atmosphere, racialized people can neither be uninhibitedly transnational nor securely national; a double-consciousness is thus vital in the face of state(s) disavowal. 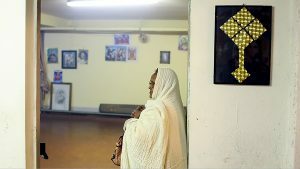 An elderly Eritrean woman after Sunday service at the Tewahedo Coptic Church, Via Quintosole, Milan. Screenshot from the documentary film Asmarina (2015), directed by Alan Maglio and Medhin Paolos. Courtesy of Medhin Paolos. All rights reserved. In her study of citizenship and illegal immigration in the United States, Ngai urges us to rethink American immigration history in the context of global developments and structures in order to "dislodge the colonialists and superpower nations from their self-claimed positions at the center of world history" (2005, 6). United States expansion in the Caribbean since 1898 and its military and economic involvement in Central America throughout the twentieth century led to massive land expropriation, dictatorships, and violence against vulnerable communities, particularly indigenous populations, Afro-religious groups, and women. Similarly, Italy’s colonization of Eritrea, Somalia, and Ethiopia created apartheid systems that engendered ethnic clashes and intensified border conflicts and violence in the African nations. Yet, Italian—and European—discussion about the "refugee and immigration crisis" of 2015 rarely takes into account the relationship between the "crisis" and twentieth-century colonialism of the global South. Ngai’s call to "rethink American immigration history in the context of global developments," I argue, necessarily requires a deeper and more intentional examination of the ways in which U.S. discourse on race and immigration intersects with other national discourses of race and immigration in the production and exclusion of racialized subjects (2005, 8). Latino/a Studies, as a field that is grounded on the intersectional study of race, immigration, and citizenship, offers a unique lens from which to answer Ngai’s call. However, such an approach requires that we geographically and conceptually expand our understanding of Latinidad to include people and communities who embrace the term in new immigrant-receiving nations such as Italy (in this group I would also include Spain, Argentina, Brazil, and Chile) (Milian 2013; Roth 2012). Though scholars have been expanding the borders of Latino/a Studies for decades, the focus of the field continues to be hemispheric. Given the migratory patterns of Latin Americans in the new millennium and the rapid expansion of social media and communication, Latinidad, as other U.S.-produced ethnic terms, has also expanded beyond the hemisphere. The hegemonic version of U.S.-commodified ethnoracial concepts (such as black and Latino) dominates popular perceptions, intellectual discourse, and, at times, legislation outside U.S. boundaries. Setting off from the premise that Latinidad emerges out of the circularity of immigration, blackness, and coloniality, my research examines how black Latin American migrants grapple with different—and often oppositional—racial systems to assert belonging and representation within the nation(s) that excludes them. Black Latinidad becomes a productive category of global contestation, but one that remains connected to racially restrictive national immigration policies, political disenfranchisement, state violence, and poverty. The growth in ethnic minority groups in new immigrant-receiving nations has led to a global embracing of ethnoracial categories (Latino/a, black) as people attempt to make sense of their places and displacements in the nation and the world. One key question that guides my analysis is the following: How do the discourses of immigration and the discourses of race jointly operate to violently exclude and silence racialized people from the nation? Race is both a local and a global construction that, though historically specific, also develops in constant vaivén (coming and going) across geographies, histories, markets, and polities through formal and informal channels. However, as my encounter with the African vendor illustrates, the hegemonic version of U.S.-commodified ethnoracial concepts (such as black and Latino) dominates popular perceptions, intellectual discourse, and, at times, legislation outside U.S. boundaries. It is imperative then, that U.S. scholars examine how hegemonic U.S.-mediated concepts of race are shaping the experiences of racialized people across the world. More importantly, we must also examine how racialized citizens and immigrants translate these hegemonic ethnoracial concepts to build local, transnational, and global networks of inclusion in order to change legislation and to gain political representation. More importantly, we must also examine how racialized citizens and immigrants translate these hegemonic ethnoracial concepts to build local, transnational, and global networks of inclusion in order to change legislation and to gain political representation. In Italy, a country that does not have a tradition of pluralistic immigration and multiethnicity, finding a language of contestation for communities of immigrants and people of color has led to a complicated process of transatlantic interpellation. If italianità symbolically and legally makes room for the Italian émigrés and diaspora in the Americas, it necessarily then includes (even if it does not explicitly say so) American racialization of ethnic Italians. The exclusion of Italian di colori from the nation thus also summons a confrontation with the nation’s historical racialization of emigrés and southerners. Perhaps because of the multiple contradictions surrounding italianità, young activists like Paolos have traded racial and cultural identity labels for the politically situated civic category "Generation 2" (G2). The summoning of the local and temporally specific demands for citizenship rights for immigrants and their descendants challenges the hegemonic rhetoric of italianità that excludes them. The nation defines its citizens through statutory regimes (people born in the nation, those who have been naturalized, etc.). However, we know that legal citizenship has not sufficiently guaranteed national belonging, representation, equality, and justice for all people assumed to be citizens of the nation. Rather, the political actions of people I theorize as "almost citizens"—those born in countries with jus sanguini laws, children of undocumented migrants, undocumented youth migrants, second-generation and racialized citizens—often force the nation–state to recognize its failures and neglects. In the United States, for instance, the Dreamer Movement that gained momentum during the 2008 elections led to the passage of DACA in 2012 as well as to sustained institutional changes and public dialogues regarding the relationship between race and national identity. Similarly, in Italy, the political actions of the G2 movement— second- and third-generation Italian descendants of immigrants—also represent important models of contestation. Political pressures from the G2s have led to important advances in Italian citizenship legislation between 2012 and 2014. A comparative analysis of Dreamer and G2 discourses sheds light on the ways in which race is translated across cultural and political groups to build networks of solidarity and to gain citizenship rights and public and sustained representation. My name is Elizabeth. I am undocumented. I was brought to this country when I was five years old. . . . My parents made a choice to move here in an effort to provide a better life for their children. . . . I was enrolled in American elementary school. I take all AP classes. I play violin for the Youth Symphony. I get good test scores and I participate in my community. Yet my opportunities get slimmer and slimmer due to recent legislations. . . . Bill 458 . . . tells me that I will never be good enough. . . . I will always be second rate. This reminds me of Jim Crow when customers were turned away with cash in hand . . . all because they were a different race. . . . How could someone who doesn’t know me judge and reject me? . . . My name is Elizabeth. I am a High School senior. I was brought to the U.S. when I was five. I broke no laws. I am not a criminal. Please don’t let them treat me this way. Summoning the violent racial history of Georgia as well as the language of the Civil Rights movement, Elizabeth clarified that it is not her immigrant condition but rather her race that rendered her inadmissible to America. Referencing Jim Crow in front of the Georgia State House was an important assertion of her belonging to America’s history of racial exclusion and, perhaps more importantly, to America’s history of antiracist struggles: "This reminds me of Jim Crow." The speech garnered Georgia Dreamers the attention of nationally recognized black civil rights leaders like John Lewis and Angela Davis, both of whom publicly denounced HB 87 as a "racist" and "segregationist" piece of legislation. Elizabeth’s speech summoned the old tactics of Freedom Riders while warning citizens of the historical repetition of racial segregation through the exclusion of Dreamers like herself. Garibay’s speech is in many ways representational of the Dreamer Movement in its claim to cultural citizenship, civic engagement, and innocence: "I was brought here by my parents." But as Robin Berstein (2011) argues, racialized children are robbed of their rights to innocence, their bodies marked defiantly guilty in the eyes of the community and the law. Appealing to an other imagined American community—one sharing the history of racial oppression—to recognize her as one of their own, Garibay signaled a shift in the public understanding of race and immigration in the United States and inserted herself within the collective dream that Martin Luther King and the Freedom Riders symbolized. Redirecting her critique away from the U.S. nation–state— "Jim Crow"—and toward her fellow citizens of color—"don’t let them treat me this way"—Garibay not only proved her Americanness, she also demanded protection under the same principle of Americanness that the state so professes (and often fails) to guard: equality, freedom, and justice. Garibay’s act of citizenship and belonging thus translated the immigrant struggle into the hegemonic language of antiracist contestation ("I have a Dream"), recognizing, as did the street vendor, the political value of U.S. blackness. I was born in Milano. I have travelled no further than Rome. I speak only Italian, and a few words in bad Spanish. I went to school here. I broke no laws. . . . Yes, I am black, yes, I am Latina, but those are races, not countries. . . . Everyone deserves a country. . . . I know a piece of paper will not guarantee my happiness. But people in Italy need to recognize, and be aware that my lack of this "piece of paper" limits even the most mundane of activities. That it erases me from this country in which I was born. Instead of rights you give us invitations. Invitations to share our food with you, share our music with you, share our language with you, clean your houses for you, raise your kids for you, give your men pleasure and children . . . while simultaneously denying us the basic human rights of being counted as a citizen. I think in all fairness this erasure should count as an act of war. And if war is what you want, well then I am not going down without a battle. Jovanna’s emotional address in the context of the "Day of Multicultural Unity" during the 2015 Milano Exposition garnered applause as well as hesitation by a politically mixed audience used to celebrating diversity while simultaneously excluding the "diverse" subjects from italianità. Jovanna’s testimony merits deep analysis and discussion. At this point I want to focus merely on two of the premises guiding her speech: her act of citizenship and her interpellation of black Latinidad. In her address in Milano, Rodríguez, like Garibay in Georgia, appeals to the audience—her fellow Italian citizens—to recognize her italianità, reminding them that failure to do so derives solely from racism and prejudice: "Yes, I am black, yes, I am Latina, but those are races, not countries." The discomfort that her speech created among the festive empanada-eating-salsa-dancing audience further crystalized how the legal implications that have led Rodríguez to simultaneously feel Italian and be exiled from italianità are mirrored by social perceptions of italianità that guide local notions of citizenship and belonging. This dynamic was also exemplified in the street vendor’s surprised response at Paolos’ ability to speak Italian. But Rodríguez’s claim to Latinidad and blackness, two categories produced and disseminated by the United States, also brings attention to the ways in which racialized citizens "talk back" and assert belonging through affirmations of the very categories invented to exclude them. Because of her race, which she defines as both black and Latina, Rodríguez believes she is denied admission into italianitá. But it is also because of her sense of political belonging to a global network of blackness/Latinidad that Rodríguez has found a political lingua franca from which to translate her own position of exclusion to a larger, more supportive, and perhaps more powerful audience. In the face of state disavowal, Rodríguez’s political claim to black Latinidad validates her right to Italianess by a larger transnational community. Mal Smith, an African American blogger, wrote that Rodriguez’s situation "is the centuries of struggle of the black woman who remains unseen." Her speech made Rodríguez visible as she claimed her part in the global struggle for democracy and equality. The fact that portions of Rodríguez’s speech were tweeted in Italian, Spanish, and English by blacks and Latinos throughout Europe and across the Atlantic further confirms her avowal as both Latina and black. The examples I have shared in this concise analysis point to the advantages of developing new frameworks of analysis that can broaden our comparative approaches to race, ethnicity, and migration while paying attention to the particular ways in which the experiences of racialization and immigration manifest in people’s lives and struggles. Rodríguez’s black Latinidad, however, further demonstrates how restrictive immigration laws produce new categories of racial difference, which shed light on the nation’s vision of itself in relation to the world. These "new categories," as both Rodríguez’s and Garibay’s speeches demonstrate, are always linked to the historical processes of vaivén, which have marked the production of racialized "almost citizens" for the past century. The examples I have shared in this concise analysis point to the advantages of developing new frameworks of analysis that can broaden our comparative approaches to race, ethnicity, and migration while paying attention to the particular ways in which the experiences of racialization and immigration manifest in people’s lives and struggles. Yet, as my conversation with Paolos revealed, this process is intricate and thus requires that we dislodge and translate the multiple ways in which the nation–state yields "acceptable" versions of racial inclusion and of how, in turn, people make sense of these labels to talk back. Or, as Paolos explained to me, "Though black Italian is not my blackness, I mean, my history is not that of slavery, my language is not English, my music and food are other music and food, but . . . I am black and Italian. And there are simply no other words in any language that more adequately describe me." Medhin Paolos is the co-director of the documentary film Asmarina (2015). She is also one of the leaders of Rete G2, a national organization fighting for citizenship rights of second-generation immigrants born in Italy. The Sentencia, as the law was nicknamed, has led to multiple scholarly conferences, volumes, and cultural initiatives across the hemisphere. In 1992, Italy passed Law 91 which declared that second-generation immigrants could access citizenship upon reaching adulthood, pending successful completion of the application within a period of one year. Law 91 replaced the 1912 legislation 555, article 3, which allowed for automatic citizenship rights for second-generation immigrants on their eighteenth birthday. Rete G2 Report http://www.secondegenerazioni.it/articoli-e-parole/Accessed October 3rd, 2015. Deferred Action for Childhood Arrivals (DACA) was introduced by President Obama in 2011. The immigration policy allows certain undocumented immigrants who entered the country before their sixteenth birthday and before June 2007 to receive a renewable two-year work permit and exemption from deportation. Georgia HB 87 required law enforcement officers to inquire about immigration status during routine stops for minor traffic violations and to hand over any undocumented suspects to federal authorities. The bill also required most employers to check immigration status through the federal "E-verify" database and stipulated possible prison sentences for those convicted of knowingly harboring or transporting undocumented residents. The actions effectively legalized racial profiling, marking black and brown bodies as suspiciously foreign. Georgia HB 458, which was defeated, would have added to HB 87 by prohibiting noncitizens from attending all public colleges in the state. Speech by activist Jovanna Rodríguez. 2015. Multicultural Week, Milano. July 20th, Milano Centrale, Milano, Italia. Bernstein, Robin. 2011. Racial Innocence: Performing American Childhood from Slavery to Civil Rights. New York: New York University Press. Dávila, Arlene. 2000. Latinos, Inc.: The Marketing and Making of a People. Berkeley: University of California Press. Lombardi-Diop, Christina, and Caterina Romeo, eds. 2012. Postcolonial Italy: Challenging National Homogeneity. London: Palgrave Macmillan. Milian, Claudia. 2013. Latining America: Black-Brown Passages and the Coloring of Latino/a Studies. Athens: University of Georgia Press. Ngai, Mae. 2005. Impossible Subjects: Illegal Aliens and the Making of Modern America. Princeton: Princeton University Press. Parati, Graziella. 2005. Migration Italy: The Art of Talking Back in a Destination Culture. Toronto: University of Toronto Press. Roth, Wendy. 2012. Race Migrations: Latinos and the Cultural Transformation of Race. Stanford: Stanford University Press. Wilson, Simone. 2012. "Black People Have a Responsibility to Support the Dream Act." LA Weekly, February 28. http://www.laweekly.com/news/angela-davis-says-black-people-have-a-responsibility-to-support-the-dream-act-2392524 Accessed April 12, 2013. This paper is an early version of an article that was published in Kalfou 3:2 (2016) with the title "Black in English: Racial Translations and National Belonging." © The Regents of the University of California. Included here by permission of Temple University Press. http://dx.doi.org/10.15367/kf.v3i2.102 All Rights Reserved.